There’s been wall-to-wall coverage of the 2016 presidential election, but even if you’ve been relying on Anderson Cooper instead of Steve Doocy to make sense of it, you might still be feeling nonplussed. Or if watching the world burn is more your cup of tea, maybe you’ve been keeping up with The Onion’s coverage of the democratic process’ doomsday. Whatever the case may be, you might be ready for a fond look back at the sniffling, facts-shuffling, bilingual-pandering of candidates’ road to the White House. Well, you’re in luck—tomorrow night, The Onion will air its very own retrospective of the whole mess. 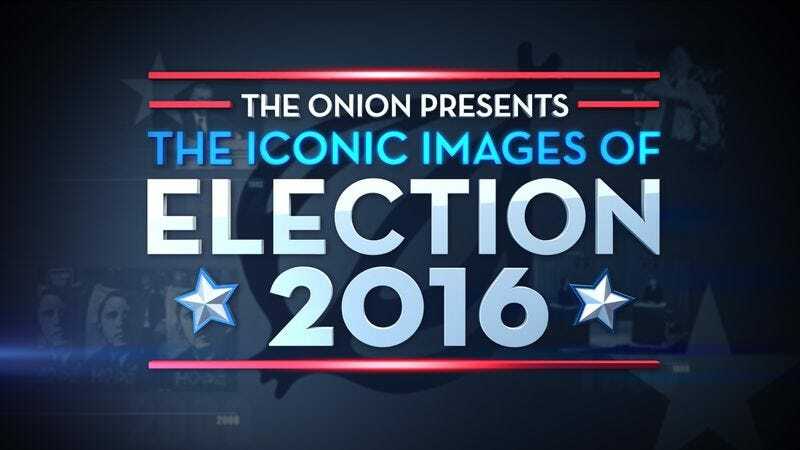 The Onion Presents: The Iconic Images Of Election 2016 will revisit the “crucial moments that shaped one of the wildest presidential campaigns in America’s history” in its first television collaboration with Fusion. The special airs October 21 at 9 p.m. ET on Fusion, which gives Donald Trump and Hillary Clinton just enough time to answer the Onion’s questionnaire.